In a steady, vicious rain that drenched the players moments into warm up and turned long passes into an exercise in skipping stones, the Swarthmore women’s soccer team recorded its first win of 2011, 3-0 over the home-standing Widener Pride. Sophomore Amber Famiglietti’s 22nd minute blast stood up as the game winner and Emma Sindelar ’15 added an insurance goal as the Garnet opened the 320 Challenge – Swarthmore’s head-to-head athletics matchup with Widener – with a victory. Widener dominate the initial five minutes of play before the Garnet could settle in. But for the remainder of the game, it was all Garnet as Swarthmore sent wave after wave forward and pinned the Pride deep in their defensive end. On the match, Swarthmore outshot Widener by a whopping 25-2 margin. In the 17th minute, Mariam Vonderheide ’13 nearly put Swarthmore ahead off a well-placed cross from Emily Coleman ’12 but the Widener backline was able to deflect Vonderheide’s effort towards goal and it pinballed harmlessly away. Moments later on the opposite end, the Pride nearly opened the scoring off a corner when the kick trickled across the box to an unmarked Brittany Balentine. But the wet ball took an awkward hop and Balentine was unable to control cleanly with an empty net in front of her. Finally, 22 minutes in, Swarthmore jumped ahead. As Alexa Ross ’13 advanced through the midfield, she found Famiglietti on her right 25 yards from goal. With seven yards of space in front of her, Famiglietti unleashed a high arching shot that dropped between the crossbar and the outstretched arm of keeper Valarie Perretti for the team’s first goal of the season and the second of Famiglietti’s Swarthmore career. Despite several further first-half opportunities off crosses from Ari Spiegel ’13 and Coleman and strong work in the middle by sophomores Megan Brock and Aly Passanante, the teams went into halftime with that 1-0 score. Famiglietti nearly doubled the lead in the 54th minute lining up a shot from just on top of the 18 yard box. It took a sprawling save by second-half substitute keeper Vanessa Hejnas to keep the Pride within one. Off the ensuing corner, Alexa Ross’ header went high. In the 65th, Swarthmore again came forward on a counter with Brock and Sindelar. With a few touches, Brock caressed the ball behind the Widener defense and in to Sindelar, who expertly finished for her first collegiate goal and a 2-0 Swarthmore edge. The assist was also the first of Brock’s career. Ten minutes later, another duo would combine for their first collegiate goal and assist. Again inside the attacking third, Vonderheide touched to the left to a cutting Amy DiPierro who finished high to put the Garnet ahead 3-0. For Vonderheide, it was her first collegiate point in her 15th match. The 3-0 thumping avenged last year’s 1-0 overtime loss to the Pride at Clothier Field. 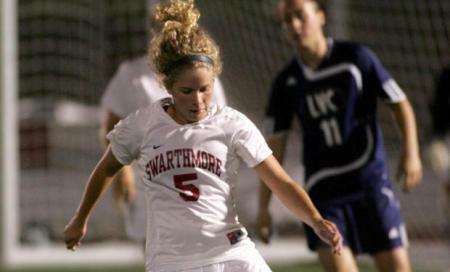 Swarthmore returns to action on Saturday against Marywood with the match at the University of Scranton. Kick-off is scheduled for 1:00.